Today is national what? 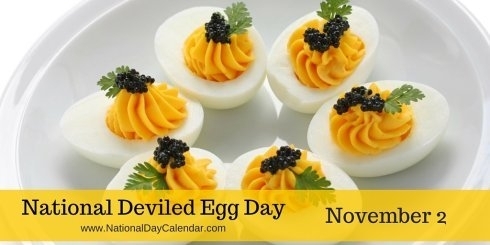 It's national Deviled Egg Day. | A.B.E. Remodeling, INC.
Another to see....... there's a national day for just about anything. A popular hor d'oeuvre or side dish for parties, holidays, family reunions and potluck dinners, deviled eggs are the star of the show on National Deviled Egg Day which is observed each year on November 2. Deviled eggs are such a well-loved food that special sectioned carrying dishes and plates have been designed for them and prepared and packaged deviled eggs are now available in some U.S. supermarkets. Deviled eggs, also known as eggs mimosa, stuffed egg, salad eggs or dressed eggs, are hard boiled eggs which have been boiled, shelled, cut in half and filled with the hard-boiled egg's yolk mixed with other ingredients such as mayonnaise and mustard. Other frequently added ingredients include: tartar sauce, Worcestershire sauce, diced pickle, pickle relish, salt, pepper, cayenne pepper, chipolte chillies, turmeric, vinegar, green olives, pimentos, poppyseed, thyme, cilantro, minced onion, caviar, cream, capers or sour cream. After the filling is scooped or piped back into the egg cup, it is often times sprinkles with paprika as a garnish. Caviar, anchovy, bacon, herring or jalapenos are some of the other popular options that are sometimes used as a garnish to decorate the deviled eggs. The first known print reference referring to the term "deviled" in reference to food, appeared in 1786. It was in the 19th century that it came to be used regularly when referring to spicy or zesty food, including eggs prepared with mustard, pepper or other ingredients stuffed in the yolk cavity. Enjoy this "tried and true" Basic Deviled Eggs recipe. Our remodeling plug for the day is..... new countertops. Perhaps you would like a new countertop if yours has age to it and you want a change. Just saying - A new countertop would 1) enhance your kitchen and 2) make that plate of deviled eggs look divine sitting on a beautiful new countertop. We're here to help.